Insurance Coverage for Commercial Fire Control | The Voss Law Firm, P.C. Commercial fire insurance is a necessity for both large and small businesses. It can give owners the small comfort of knowing that their business will survive even if their structure is consumed by a fire. However, these policies can be worded very carefully to exclude certain damages resulting from a fire, causing owners to be drastically underpaid after a fire. 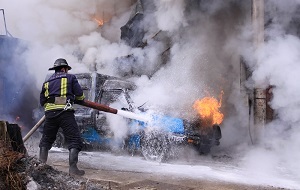 Attorney Bill Voss examines the finer details of commercial fire insurance policies to help business owners get maximum compensation for a loss. Will Your Insurance Cover Complications of a Commercial Fire? Insurers always want to minimize payouts to their policyholders. As a result, a basic fire policy may cover only damage done by fire—that is, done by the actual heat or flames of a fire. If damage was not caused by the fire itself, a policyholder may have a hard time collecting payment for certain losses. Smoke damage. Some commercial policies will cover damage done by flames of a fire, but will not cover smoke damage to your business. As a result, businesses will have to take a loss on any inventory that has been rendered unusable, such as soft goods where the smell cannot be removed. Water damage. As incredible as it seems, some insurers do not cover water damage from fire hoses as a covered loss in a fire damage claim. Water may pool in the lowest level of a building for days until it can be pumped out, causing damage to the foundation and increasing the risk of mold. Damage done by emergency responders. Some blazes require firefighters to cut through a wall or punch through the roof to attack the fire, and this structural damage may not be covered in a standard fire policy. Even if damage is covered under your fire policy, there may be additional exceptions that prevent you from restoring your property to the way it was before the fire occurred. For instance, insurers may only pay to rebuild the structure so that it is up to code and has the same square footage. If your business was housed in a historic structure that will need custom work to restore architectural details, the insurer will likely not pay for these items unless your policy specifically covers them. If you and your insurer are interpreting your fire damage policy in two very different ways, we can help. Simply fill out the form on this page today to contact the Voss Law Firm or order a free copy of our book, Commercial Property Owners Must Read This BEFORE Filing an Insurance Claim.